The home selling process has a ton of different steps and precautionary items needed to ensure a smooth and seamless transaction. It can be overwhelming, but if you're lucky and have an amazing team to take you along for the ride it can be as easy as 1-2-3! Here at Cain Realty Group, we want to be there for every step of the process in order to give you the highest level of service when you sign with our team. Providing you with all the information you need to have a seamless transaction is important to us, therefore, we don't want to leave anything out. There is one thing in particular that can easily get lost in all confusion of the transaction, that is a vital aspect of the success of the sale. Being a homeowner comes with a long list of maintenance to-do's and commitments to ensure the property is in tip-top shape throughout the transaction. 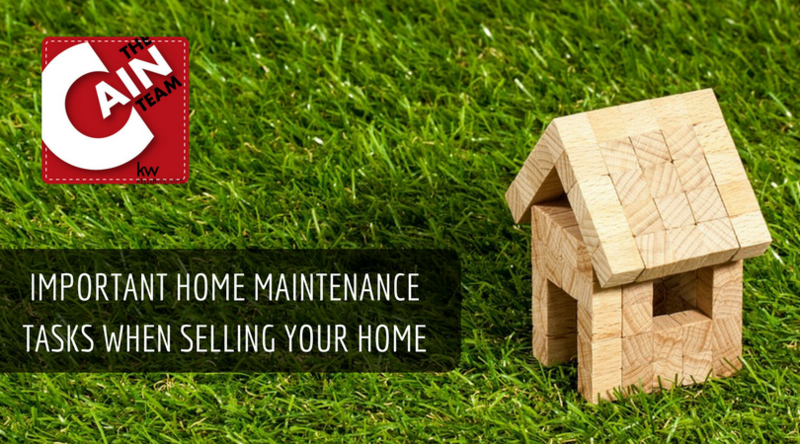 We've got news for you, just because you're selling doesn't mean you are off the hook from routine maintenance tasks. Keeping up with these tasks can help you avoid a mess of catastrophic issues that can arise down the line and devalue your property resulting in a possible derail of the sale. To prevent from a world of possible issues by focusing on these four important areas to maintain your property until the final sale. Whether you're still living at the home or not, you'll want to make sure to keep your landscaping tidy—remove dead tree limbs, rake leaves, and clean out flower beds. Aside from the cosmetic reasoning behind keeping the outside of your home tidy, it is important to keep possible vandals away. If your home is vacant, has a 'for sale' sign, and looks neglected, it is as if you are placing a bulls-eye on your home for vandals to break into your property.